Rock 'n' roll opens strong. 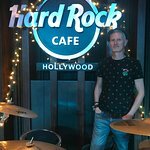 So does the rock ‘n’ roll restaurant – with mouth-watering appetizers crafted by hand and made from scratch. Try the jumbo combo for a sampling of our greatest hits. Fresh corn tortilla chips piled high with Jack and cheddar cheeses and seasoned pinto beans. Served with sour cream, chopped green onions, pico de gallo, jalapeños and a side of fresh Hard Rock Grilled Salsa. Big enough to share. colossal wings, hickory-smoked in our hardwood smoker. Have them buffalo style or fire-grilled with your choice of classic rock, heavy metal, or tangy bar-b-que sauces. Served with celery sticks and blue cheese dressing. Large potato shells, fried golden brown, filled with Jack and cheddar cheeses, crisp seasoned bacon and green onions. Served with a side of sour cream for dipping. 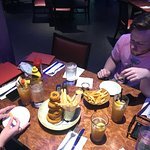 Boneless, seasoned and breaded chicken tenders, served with honey-mustard and Hickory Bar-b-que sauces on the side or tossed in our classic rock, heavy metal, or tangy bar-b-que sauces. Served with celery sticks and blue cheese dressing. Fresh diced roma tomatoes marinated with chopped garlic, fresh basil, and aged balsamic vinegar on olive oil toasted, sliced ciabatta bread. Topped with parsley, grated romano, and shaved parmesan cheese. Stuffed with‏ spinach, black beans, cilantro, corn, jalapenos, diced red peppers and jack cheese. Served with freshly made hard rock salsa, guacamole and chipotle ranch dressing. Fresh, fine, earth-friendly ingredients are a given here. our chefs care deeply, so that steak is nothing less than center-cut USDA choice, corn-fed and aged for 21 days, and that salmon filet is from the pristine fjords of Norway. 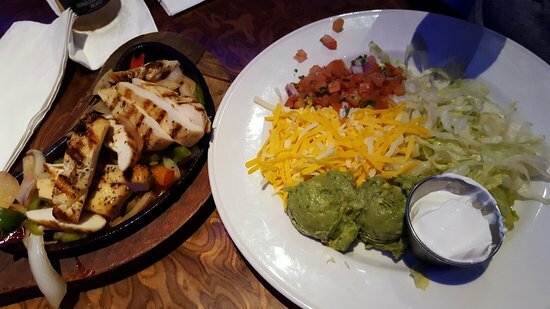 Your choice of grilled chicken or beef served with pico de gallo, shredded monterey jack and cheddar cheeses, fresh guacamole, sour cream, shredded lettuce and hot flour tortillas. A USDA choice 21-day-aged, center-cut, 12 oz. New York strip steak grilled to your liking and topped with merlot-garlic butter. Served with fresh vegetables and garlic herb smashed potatoes with gravy. Choice 8 oz. sirloin steak grilled to your liking and topped with Merlot-garlic butter. Served with fresh vegetables and garlic herb smashed potatoes with gravy. A grilled chicken breast tops off twisted cavatappi pasta tossed in a lightly spiced 3-cheese sauce, with garlic, roasted red peppers and romano parsley bread crumbs. Served with a side of garlic toast. A tender marinated boneless chicken breast fire grilled and served on a bed of thin spaghetti pasta with a hint of garlic, romano cheese, mushrooms and fresh spinach leaves. Topped with mushrooms and a rich marsala wine sauce, Served with fresh vegetables. An 8 oz. Filet grilled and topped with a Merlot-garlic butter and served with confetti rice and fresh vegetables. All our delectable beef legends come with seasoned fries. or, for a little extra, freshly hand-breaded onion rings. Layer on caramelized onions or braised mushrooms for an additional charge. Famous the world over, topped with seasoned bacon, two slices of cheddar cheese, a crisp fried onion ring, lettuce, tomato, and pickles. Basted with spicy chipotle pepper puree and topped with Montery Jack cheese. Served on a buttered-toasted bun with hard rock guacamole and grilled onions. Basted with our special Hickory Bar-b-que sauce and smothered with caramelized onions. Topped with crisp seasoned bacon and melted cheddar cheese. Topped with three thick slices of your choice of cheeses. Choose from American, monterey jack, cheddar or swiss. Laced and grilled with our spicy buffalo sauce and cajun seasoning, then topped with crumbled blue cheese and a crisp Fried onion ring. A toasted bun brushed with ranch dressing, fresh cucumber slices, lettuce, tomato, fresh made hard rock guacamole and topped with monterey Jack cheese. Our grilled veggie leggie patty is topped with a grilled portabello mushroom, zucchini, yellow squash and roasted red pepper. served on a toasted bun with lemon mayo, leaf lettuce, sliced tomato and grilled sweet onions. Served with a salad with your choice of dressing. Grilled turkey patty served on a toasted bun with jerk mayo, leaf lettuce, tomato slice and red onion rings. topped with pepper jack cheese and fresh avocado slices. Served with a salad with your choice of dressing. 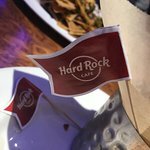 The official food of rock is also the official food of the world. so take the opportunity to savor your Legendary Burger with some authentically mouth-watering local flavor whether it’s an Asian spin in Tokyo, a south american zing in Buenos Aires or a European twist in Paris. Just ask your server about the local Legendary burger served here. Just like in Tennessee, the smokers are here in our kitchen, where they should be. Your chef can make sure it brings out just the right, rustic, wonderful, wood-smoke flavor. Can’t decide? get the best of our smokehouse! your choice of bar-b-que ribs, bar-b-Que chicken or smoked pulled pork. Served with seasoned fries, ranch beans and fresh cole slaw. Our famous southern-style half-chicken, rubbed, grilled, and basted with our authentic hickory bar-b-que sauce. Served with seasoned fries, ranch beans and fresh coleslaw. A full rack of west tennessee-style ribs rubbed then basted with our authentic hickory bar-b-que sauce and cooked to perfection – so the meat falls right off the bone. Served with seasoned fries, ranch beans and fresh coleslaw. All sandwiches served with seasoned fries or substitute onion rings for additional charge. add a side caesar or house salad for additional charge. Add a side caesar or house salad for an additional fee. 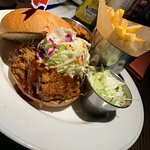 Ask your‏ server about today’s catch that is blackened over a fire grill and served on a toasted bun with dill mayo, fresh cucumber planks, shredded iceberg lettuce, leaf lettuce, sliced tomato and sweet red onion rings. Served with a salad with your choice of dressing. Grilled chicken, crisp seasoned bacon, fresh avocado slices, tomato, lemon mayo and lettuce on toasted bread. Served with seasoned fries. Poached chicken tossed with celery, green onions, in a light citrus mayo dressing with dijon mustard and dill; on a toasted hoagie roll with spring mix topped with dried cranberries and goat cheese crumbles. Served with a side salad or fresh seasonal fruit. If you’re looking for pulled pork, you’ve come to the right place. We’re the smokehouse masters. Sandwiches served with seasoned fries, ranch beans and fresh cole slaw. Any sandwich can be made with smoked pulled chicken as an alternative. Hickory-smoked pork, hand pulled, so it’s tender and juicy. Served with your choice of our authentic vinegar-based or hickory bar-b-que sauces and topped with marinated slaw. Our in-house smoked chickens that are hand-pulled, so the meat is tender and juicy. Served on a toasted ciabatta bun topped with our hickory bar-b-que sauce. Topped with our creamy cole slaw. Asian 5‏ spice bar-b-que sauce with homemade asian style pickled cucumbers with sriracha mayonnaise drizzle. Tangy homemade south carolina style mustard bar-b que sauce with crispy slaw and crispy cayenne onions. Chipotle and hickory bar-b-que sauce, cheddar cheese, crispy jalapenos and crispy onions everything is bigger in texas! Go big and make it a 10oz. bar-b-que sandwich for an additional charge. All of our fabulous creations are served on our thin and crispy Neopolitan style crust. Sliced tomatoes, caramelized garlic, mozzarella and romano cheese. Topped with fresh basil. Shredded smoked chicken, hickory bar-b-que sauce, red onion, mozzarella cheese and cilantro. Fennel sausage, sliced salami, spicy capicola and mozzarella cheese. Topped with crushed red chilies, basil and oregano. Grilled chicken, basil cream sauce, oven roasted tomatoes, mozzarella and romano cheese. Topped with fresh basil and toasted pine nuts. Fennel sausage, seasoned mushrooms, mozzarella, romano cheese and tomato sauce. Grilled portabello‏ mushroom and zucchini layered with roasted red bell pepper, caramelized onion, roasted garlic, tomato, goat cheese, mozzarella and romano cheese. We match the extraordinary and fresh produce with an extraordinary selection of hand-made dressings: ranch, honey mustard, honey citrus, caesar, blue cheese, balsamic vinaigrette, lite Italian and oil and vinegar. Fresh cut greens tossed with sweet red onions, grilled cajun chicken and tossed with our honey-citrus dressing. topped with fresh orange segments, spiced pecans, red pepper strips, sweetened dried cranberries and blue cheese crumbles. This hard rock special combines fresh mixed greens, carrots, corn, diced tomatoes, pico de gallo and shredded cheese. topped with tupelo fried chicken or a grilled chicken breast. Tossed with ranch dressing and topped with spiced pecans and crisp tortilla straws. Crisp romaine lettuce tossed with our scratch-made caesar dressing, fresh baked croutons, grated romano cheese and crispy seasoned bacon bits. Garnished with shaved parmesan cheese and whole black olives. Spring mix tossed with goat cheese crumbles, chopped seasoned bacon and a sweet dijon pear dressing. Topped with poached pear segments, spicy pecans and grilled sweet cajun shrimp. Freshly chop‏ mixed field greens tossed with diced smoked chicken, spicy bacon and pecans, cheddar cheese, pico de gallo with a smoky citrus vinaigrette and topped with fresh sliced avocado. Hard rock cafe is proud to feature ben and jerry's as our premium ice cream. Definition - a bite, a nibble, a taste. Just enough to satisfy one or order a round to share. Everyone has room for a bite. Each available in a souvenir glass for an additional fee. (177 Calories) Simple and light: rich whipped chocolate mousse Served with a light chocolate sauce. A rich‏ new york-style cheesecake filling with a light graham cracker crust and rich strawberry sauce. A rich french pastry cream topped with a sugar brûlée crust. (649 Calories) Made with peanut butter, cream and semi-sweet chocolate. Topped with roasted chopped peanuts. (1321 Calories) A country favorite, served warm with ben and jerry's vanilla ice cream, Topped with walnuts and caramel sauce. Ben and Jerry’s® vanilla ice cream and hot fudge on a fresh brownie, topped with chopped walnuts, chocolate sprinkles, fresh whipped cream and a cherry. Three large scoops of ben and jerry’s® vanilla ice cream, topped with our famous hot fudge sauce, chopped walnuts, fresh whipped cream, chocolate sprinkles and a cherry. هارد روك لا تفشل أبدا !! مكان عظيم! طعام رائع! في مركز المدينة! ! ! 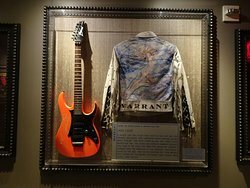 ذهبنا إلى Dave & Buster مع الأطفال للعب ثم إلى العشاء إلى Hard Rock. متعة كبيرة أن تكون & أكثر! تناولنا الطعام فى مقهى هارد روك مرتين على العشاء فى حين في هوليوود. الخدمة، الطعام وقيمة نقدية رائعة. كان نادلنا في آخر ليلة لنا Charlie C كانت رائعة. موصى به للغاية للعائلات تناول الطعام في هوليوود. الطعام لائق ولكن مبالغ فيه. كانت نادلتنا لين بكامل الطاقة رائعة. فقد حل المشكلة بسرعة على ما تناول الطعام وبما أنني نباتي صرف و glutfree. اقتراحها كان مثالياً. المطعم طنا من المرح المشروبات الكحولية أو لا. كانت الخدمة سريعة ومقدمة جيدا. بالتأكيد سوف نعود. 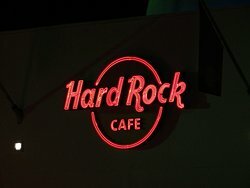 احصل على إجابات سريعة من موظفي ‪Hard Rock Cafe‬ وزوار سابقين.